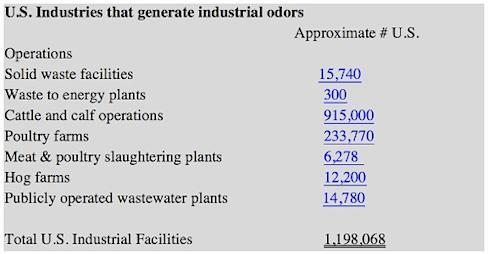 More than one million industrial sites in the U.S. generate unpleasant odors as a normal part of their operations. Although the U.S. waste handling industry makes up only a small part of that million, its revenues exceed $75 Billion annually. Landfills, transfer stations, composting operations, and countless trash containers harbor some of the most putrescent odors imaginable. With increasing urbanization, our neighborhoods creep closer and closer to these facilities, triggering more frequent complaints, regulatory violations, and in extreme situations, litigation. To combat regulatory violations, neighbor complaints, and lawsuits, the waste handling industry has historically relied on odor control products that use strong fragrances to try to overpower unpleasant odors. Some companies have even installed expensive covers and enclosures to mitigate the negative impact of odors on their neighbors. While solutions like these have historically been considered the "best available," these old strategies do not go to the root of the problem - the odor-causing compounds themselves - and therefore tend to fail. While some enzyme-based solutions do eliminate some odor-causing compounds, they often have a limited range of activity, take some time to work, and can be costly. The industry has been ripe for innovation to find a product that actually works to eliminate the odor causing compounds like hydrogen sulfides and ammonia. BioLargo®, Inc. (BLGO) first launched CupriDyne Clean in May of 2016. In the first year of its commercialization the company proved the commercial viability of CupriDyne Clean. By July of 2017, it had landed as clients 3 of the top 10 companies in the solid waste handling industry. The company's filings show CupriDyne Clean sales have doubled each of the first three quarters of 2017. With sales to waste handling facilities gaining traction, BioLargo reports it is looking to sell CupriDyne Clean into new industries. Its last quarterly report stated that it was conducting trials in the wastewater treatment industry, and its recent shareholder letter indicated it had secured its first flagship clients. Wastewater treatment is a big industry - there are more than 900 public wastewater treatment facilities in California alone. 2015 Census figures report 740,303 active firms (including municipalities and private companies) in California, representing just under $1 billion in payroll. There are more than 6,000 California firms employing more than 500 people in the industry. According to Global Information, a market research company, the global municipal and industrial wastewater sludge treatment equipment and wastewater/sludge-based odor control equipment is estimated to have been $6.5 billion in 2013, and reached an estimated $6.9 billion by year-end 2014. The compound annual growth rate (CAGR) during the forecast period, 2014 to 2019, is estimated to be 5.9%. At this rate, the market value could reach $9.2 billion by 2019. In a special Waste360 report, Joseph Provenzano, President of BioLargo's Odor-No-More® division explained, "CupriDyne Clean oxidizes all volatile organic compounds (VOCs), amines, sulfur compounds, fatty acids, and mercaptans prevalent at sites that process organics. Our products are broad spectrum and work indiscriminately on all organically derived odors. They eliminate odors rather than cover them. Most other industry products use fragrance to mask odors, often exacerbating the problem. Our products are not masking agents. Rather, this green technology breaks down odorous compounds through oxidation. Odor reduction is immediate and it is safe." BioLargo is a sustainable engineering services, science and technology company with multiple irons in the fire, with its focus on clean air, clean water and advanced wound care. According to its year-end Shareholder Letter, its industrial odor eliminator product CupriDyne is poised for exponential revenue growth. Its new sustainable environmental engineering services team is commercial and has landed its first customer contracts for 2018. Its advanced wound care products are in FDA review with expectations to go commercial in early 2018. Its award-winning advanced water treatment technology is targeting late 2018 to go commercial. BioLargo is a company to watch as it continues to build its business and focus on its mission to "Make Life Better". Except for the historical information presented herein, matters discussed in this release contain forward-looking statements that are subject to certain risks and uncertainties that could cause actual results to differ materially from any future results, performance or achievements expressed or implied by such statements. Flathead Business Solutions LLC, which owns tamarackadvisorsinc.com, is not registered with any financial or securities regulatory authority and does not provide nor claims to provide investment advice or recommendations to readers of this release. Flathead Business Solutions LLC may from time to time have a position in the securities mentioned herein and may increase or decrease such positions without notice. For making specific investment decisions, readers should seek their own advice. Flathead Business Solutions LLC may be compensated for its services in the form of cash-based compensation or equity securities in the companies it writes about, or a combination of the two. For full disclosure please visit http://tamarackadvisorsinc.com/legal-disclaimer/.